this punch is in the opening to malcolm in the middle! LOL, the third standby ref must of being packing his dacks. He should turn in a referee resume with his opponents name on it. 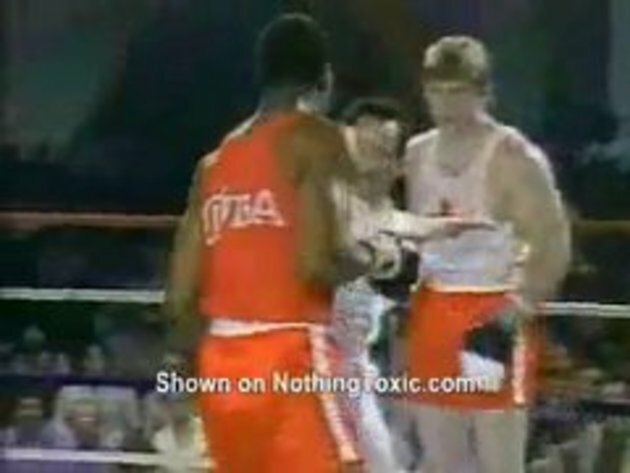 Everytime the African American boxer got cornered the referees tried to come to help him just to get hit instead. #6 look, i saw this clip a few years ago so its very old. No mather how many clips you watched you can't see them all. #5 'African American'.Did you actually watch the clip. Big letters on his back saying CUBA. Doesn't matter what he looks like he is not African American. That's exactly why you never stand between two guys in a fight, it just ends up with you on the floor. Lol, Agreed #12.. #5 Could have easily said Cuban, but unfortunately no matter what nationality a Black male is most people tend to concentrate on the color of skin (even when their nationality is written on their back in big letters ). That's not an attack on #5 as much as it is pointing out that most of us are pre-conditioned to look at all Black people as "Black" rather than Cuban, American, Canadian, French, etc.. I just felt like pointing it out with words since this was a very clear example of it. That video is so old! I think #5 was just trying to be P.C. and not use a term someone may feel is out of line. AND there are plenty of black people in Cuba. The term would be "afro-Cuban" and NO that is not a racist term.